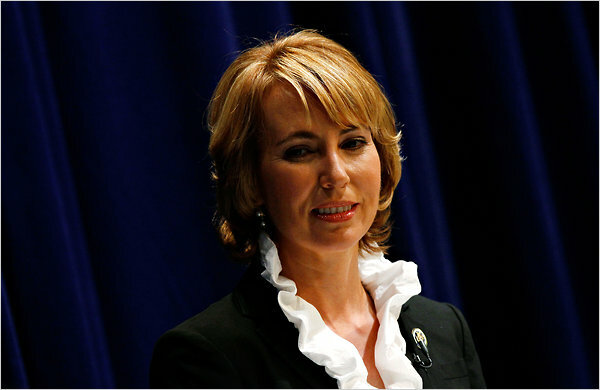 My post on the Gabrielle Giffords shooting Saturday was written in haste, and with limited information. I’ve wanted to say several things since then, but of course, much of what I wanted to say has already been said better by others. Let me, nonetheless, touch on a few points. 1. The growing evidence that the shooter, Jared L. Loughner, is psychotic does not in any way excuse right-wing political and media figures from responsibility for creating conditions that promote violence. 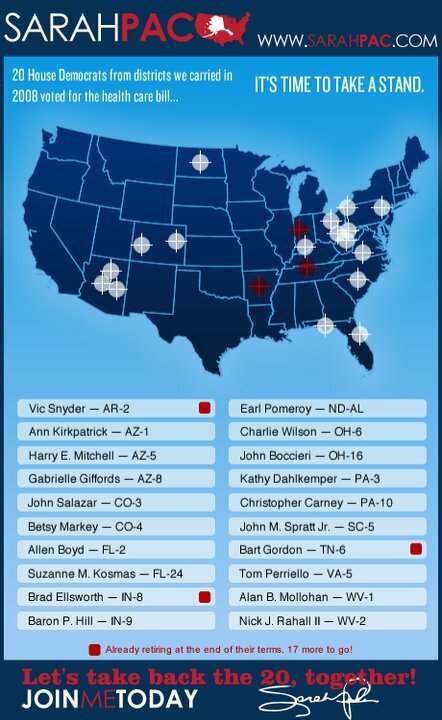 Sure, they aren’t literally responsible for arming Loughner and pointing him toward Giffords. That’s not the point. The point is that by adopting demonizing language and explicitly violent rhetoric, they increase the likelihood of such events. 2. And let’s have none of this false equivalence BS about how both extremes are equally nuts, and if only everyone would be civil. There is no equivalence of far left and far right here. None. The far left has almost no voice. The far right is a dominant force in one of the two mainstream political parties of this country. The far left is ridiculed. The far right is in control of the most powerful cable news station in the country and is taken seriously. The far right isn’t even called the far right. They are called conservatives. They are called Republicans. They are in charge of the House. And they are nuts. The Giffords shooting doesn’t prove that Sarah Palin has blood on her hands. 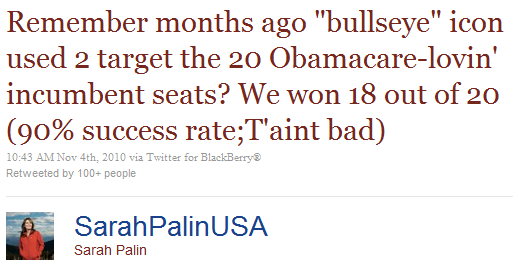 What it does prove is that when it comes to terrorism, people like Sarah Palin have a serious blind spot. On the political right, and at times even the political center, there is a casual assumption—so taken for granted that it is rarely even spoken—that the only terrorist threat America faces is from jihadist Islam. There was a lot of talk a couple of weeks back, you’ll remember, about a terrorist attack during the holiday season. And there’s been a lot of talk in the last couple of years about the threat of homegrown terrorists. Well, we’ve just experienced a terrorist attack over the holiday season, and it was indeed homegrown. Had the shooters’ name been Abdul Mohammed, you’d be hearing the familiar drumbeat about the need for profiling and the pathologies of Islam. But since his name was Jared Lee Loughner, he gets called “mentally unstable”; the word “terrorist” rarely comes up. When are we going to acknowledge that good old-fashioned white Americans are every bit as capable of killing civilians for a political cause as people with brown skin who pray to Allah? it won’t do to dig up stray comments by Obama, Allen Grayson, or any other Democrat who used metaphors of combat over the past few years, and then try to claim some balance of responsibility in the implied violence of current American politics. (Most of the Obama quotes that appear in the comments were lame attempts to reassure his base that he can get mad and fight back, i.e., signs that he’s practically incapable of personal aggression in politics.) In fact, there is no balance—none whatsoever. Only one side has made the rhetoric of armed revolt against an oppressive tyranny the guiding spirit of its grassroots movement and its midterm campaign. Only one side routinely invokes the Second Amendment as a form of swagger and intimidation, not-so-coyly conflating rights with threats. Only one side’s activists bring guns to democratic political gatherings. Only one side has a popular national TV host who uses his platform to indoctrinate viewers in the conviction that the President is an alien, totalitarian menace to the country. Only one side fills the AM waves with rage and incendiary falsehoods. Only one side has an iconic leader, with a devoted grassroots following, who can’t stop using violent imagery and dividing her countrymen into us and them, real and fake. Any sentient American knows which side that is; to argue otherwise is disingenuous.